CMAC houses the flagship journal for the biocultural study of religion, Religion, Brain, & Behavior. As an academic journal deeply invested in approaches to understanding religion that combine biological and cultural modes of analysis, RBB is a source of scholarship from and for a variety of fields. The aim of Religion, Brain & Behavior is to provide a vehicle for the advancement of current biological approaches to understanding religion at every level from brain to behavior. RBB unites multiple disciplinary perspectives that share these interests. The journal seeks empirical and theoretical studies that reflect rigorous scientific standards and a sophisticated appreciation of the academic study of religion. RBB welcomes contributions from a wide array of biological and related disciplines, including cognitive science, cognitive neuroscience, evolutionary psychology, social psychology, evolutionary anthropology, social neuroscience, neurology, genetics, demography, bioeconomics, neuroeconomics, physiology, developmental psychology, psychology of religion, moral psychology, archaeology, mimetics, behavioral ecology, epidemiology, public health, cultural evolution, and religious studies. 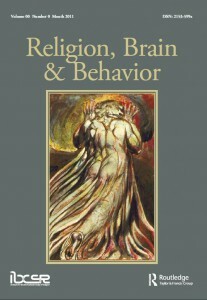 In summary, RBB considers high quality papers in any aspect of the brain-behavior nexus related to religion.